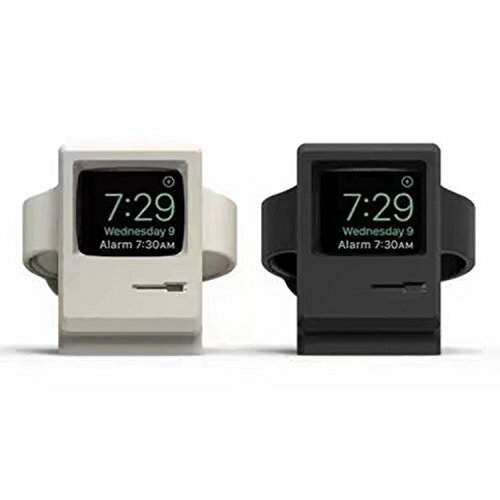 - This durable silicone Charging Dock,holds your Fitbit Blaze steadily with elegance, durability and fashion.It looks like a retro desktop computer. - Sophisticated & elegant compatible with Fitbit Blaze. - Don't need to take the tracker out any more for charging. - Indeed a great accessories fit for your new Fitbit Blaze. - With DECVO Fitbit Blaze Charging Dock, No need to remove the band or frame when recharge your Fitbit Blaze. 1 x Charging stand (Apple watch and charging line are not included). - 100% Money back guarantee. Full return if you don't receive your item, Full return if you are not satisfied with the item you received. - Classic Design: The W3 stand is modeled after the vintage computer. Your Apple Watch charges inside the stand and the screen of the watch lines up perfectly with stand when it is charging. Nightstand mode is available and the W3 can be used as a besides clock. Use the W3 Stand and experience nostalgia like never before. - Easy To Use: After installing the charging cable in the W3 stand, simply insert your Apple Watch to utilize Night Stand Mode. The silicone material makes it incredibly easy to insert and remove your Apple Watch with your hands, but keeps it steadfast inside the stand despite vibrations or shock. - Advanced silicone material: The W3 Stand is made of high-quality silicone material - which is harmless to health. Experience no discomfort when utilizing the stand. The unique flexibility and softness of the silicone prevents scratches to the Apple products and surface which the stand rest on. - Compatibility: Compatible with Apple Watch Sports 38mm Series 1,2,3; Apple Watch Sports 42mm Series 1,2,3; Apple Watch Ceramic Edition 38mm; Apple Watch Ceramic Edition 42mm; Apple Watch Milanese Loop; Apple Watch Link Bracelet; Metal charger; Plastic charger; etc. - NOTE: The package just contains a charging stand, not including Apple watch and charging line! Full return if you don't receive your item, Full return if you are not satisfied with the item you received.